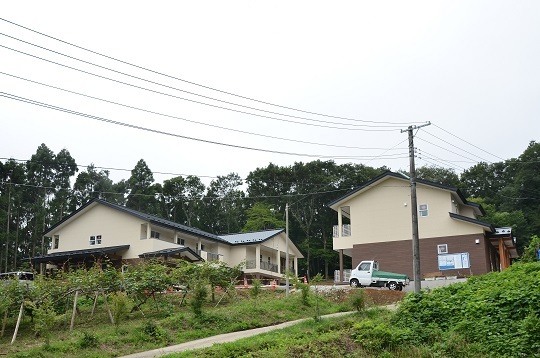 The ARI campus is located in the town of Nasushiobara, about 160km north of Tokyo. Using methods of integrated organic farming, we produce most of the food we eat, inlcuding rice, wheat, soybeans, and about 60 kinds of vegetables. We also raise a variety of livestock, all on our 6 hectares of land. Some of the fields for rice and vegetables are near the campus. 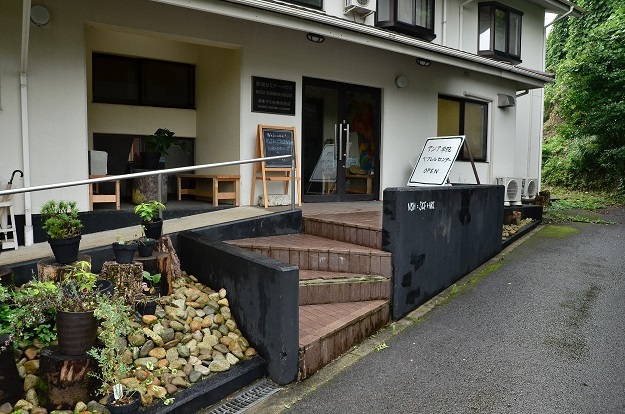 The administration part of ARI consists of the admin annex and the second floor of the Farm Shop, where you can find a reception, offices, conference rooms and the director’s room. On the first floor there is also the ARI Shop in which we sell our farm products as well as handicrafts from our participants’ coutries. Koinonia is a Greek word which means “fellowship”, and all community members gather there for meals and many social activities. It has a dining hall and kitchen as well as a public computer corner and small offices. The building includes a classroom and library for participants, too. The main building includes a classroom and library for participants. We make bread, jam, miso, tofu, and pickles for our own consumption and bread, jam, cookies and cake for sale. There are plows, hoes and shovels as well as storage for farm implements, rice, and eggs and a feed mixer. There is also a classroom. To maintain self-sufficiency for the community and our supporters, we raise about 100 types of crops and vegetables in a total of 2.5 ha of land throughout the year without using artificial chemicals. Soil is necessary to support a safe and healthy life. Soil is made from fermented organic matter (manure, plants and chaff) in compost. We use three different methods for brooding: Self-brooding uses the body heat of the young birds; compost-brooding uses the heat from compost; and umbrella-brooding uses electricity and gas heat. We take care of the brood until they can control their own body temperature. In the early stages of brooding, we feed them only brown rice. Has very good ventilation and lots of sunshine. Layer chickens grow in a natural environment with little stress on a fermented rice straw floor, males and females together. 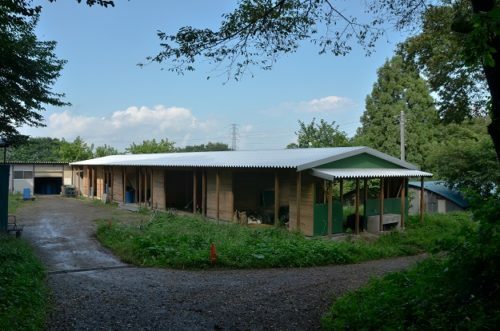 This pig shed uses a floor whose idea came from the Korean Natural Farming movement. The floor is made of one meter depth of sawdust and chaff (rice husk) mixed with soil, charcoal and fermentation bacteria from the forests around ARI. Now we raise breeding sows here. Rice is weeded by aigamo (cross-bred ducks) to relieve one of the main hurdles of organic farming. We dug a reservoir on the lower field of our campus and when it rains, it fills with rainwater from the whole area. This is a system we learned from Thai farmers in a tropical monsoon climate. The pond on the east slope is connected with one of the paddy fields and the water of the pond, with nutrients from fish excrement is the only fertilizer for the rice. On the west slope, the pond receives water from the greywater system of the women’s dormitory and kitchen, so clean water from this system and rainwater are used for fish culture. Water from the pond is used to irrigate fields of lotus root and taro. Serves as a recylce and building center. For this purpose, machinery, welding, carpentry goods and materials can be used by all community members. We have a lot of old machines and cars so the work shop is always busy. Built in 2014. 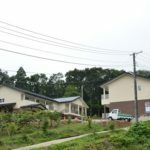 Both dorms have double rooms and shared facilities. Community members govern their own dorm life. Built in 1986. Female participants, volunteers and some staff members live there. 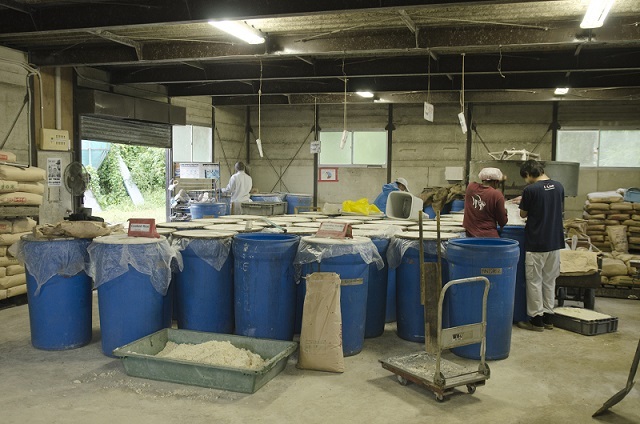 Grey water from the bath rooms is treated for ARI aquaculture. Seven staff members and their families live in staff housing on campus. Some others live in the dorms and others live off campus. *Different ages of Japanese cedar and cypress trees grow in our forest. Sometimes we cut some trees for construction, and transplant saplings in the cut spaces. We are working to conserve the forest to control soil erosion.